You might know AddThis from the sharing buttons you place on your blogs below your posts. The AddThis sharing tool is a really useful feature for bloggers. Not only does it provide you with a means to share your great content, it also monitors the information shared to analyze data and provide insights to publishers and note the latest trends. In the process, the AddThis sharing tool has evolved into a much faster and more powerful one which not only can easily be integrated with your website, it also provides a great and easy sharing experience to your readers. AddThis has recently released a sleeker, more elegant sharing tool which adds a lot of new features. Let's take a look at what's new, and how to get it! The most obvious change is the design. The sharing buttons look better, the compact menu is more streamlined, and the email form has a new look. In addition, the drop-downs make use of HTML 5 and JQuery, and load faster and are better optimized. Sharing from expanded menus has become faster as well. According to AddThis, the enhanced design has increased sharing by as much as 11%! Then there is the great new on-page sharing feature. Normally, to share something, you have to open up a new window, and then click on the share/post button. This costs an extra page-load, which makes the process slower. The new AddThis sharing options provides you with the 'instant' inline sharing feature. 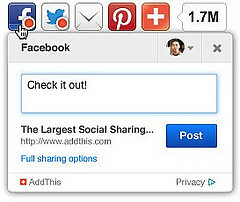 Now, users no longer have to leave your page to share your content, as it can be done right from the AddThis buttons! This will be possible if users are logged into AddThis. And once they are, they will be able to easily share content (staying on the same page) on OTHER sites as well that use AddThis. AddThis also makes sharing on Pinterest really easy. Simply put AddThis to any page on your site, and your users will automatically be able to see all the images on that page in a light-box gallery view to choose from easily, and pin to Pinterest. Simple, and effective! Adding this functionality to your site is really easy! Just visit the Sharing button page, and choose the type of buttons you want. You can choose from among seven different styles, which you can live preview on the page. You can also go for plug-in based tools for WordPress and Blogger etc. Otherwise, you will just see some code, which you can copy and paste to your site wherever you want and the sharing buttons will appear there. I'd recommend going for plugins plugins if available, but it's totally up to you.